Investors focused last week on a moderate easing of trade tensions and a solid second quarter gross domestic product report. Corporate earnings also drew headlines, particularly troubled results that ravaged Facebook’s stock price. U.S. indices were mixed, although the S&P 500 Index posted a fourth weekly gain, rising 0.6%. The energy, industrials and financial sectors were the best-performing areas, while technology and consumer discretionary came under pressure. Strong economic growth and stellar corporate earnings continue to provide reasons for investors to bid stock prices higher. Trade tensions eased a bit last week, but uncertainty over policy is keeping financial markets in check. We expect the equity market to maintain its current trading range until trade tensions ease. After weeks of rising trade tensions, the U.S. and EU meeting last week resulted in some rare positive trade-related news. It is unclear whether this marks a broader shift away from protectionism or is an isolated event. But at this point, the bar for positive surprises is so low that even news that negotiations are continuing is considered a win for supporters of free trade. The recent pattern suggests that President Trump will shortly resume his harsh trade rhetoric, so we are approaching the issue cautiously. But we would welcome any move away from trade protectionism. So far, actual economic damage from imposed tariffs and harsher trade rhetoric has been minimal. However, politicians could still enact additional restrictive measures that could cause more serious fallout. The uncertainty over the future of trade policy is causing problems for equity markets, as expectations are rising that companies could delay investments or business plans as they await additional clarity. The good news for stock markets is that corporate profits have been stellar this year and economic growth remains solid. These factors have kept stock prices from falling in the face of trade uncertainty and kept government bond yields relatively low. Any improvement in the trade backdrop should cause both stock prices and bond yields to move higher. For now, however, we expect financial markets to continue churning and stocks to remain in the same trading range they have been in since early February: a high of 2,875 and a low of 2,532 for the S&P 500 Index. 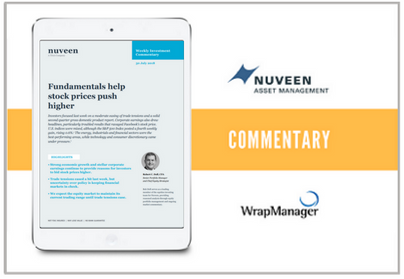 Download Nuveen's Weekly Investment Commentary to see their 5 weekly top themes, including data on why the second quarter GDP report was the strongest in years and why this might represent a peak for 2018. To learn more about Nuveen, their performance, or how to invest your core portfolio, request more information on this manager now.